So you participated in 5 startups, after which you scaled an organization from zero to 1,500 employees and $2B/year in revenue. Talk about your background and experience at United Health. Tell us a bit about your decision to raise a fund. When I started raising fund I, I had calls with 30+ GPs and my target was $5M but I told him, under no circumstances would I raise more than $10M, even if things went really well. He responded that the difference between a $5M and a $10M is significant and that the story and strategy would be very different for the two. So I know that you started with a $7M target and ended at $18M… how did your strategy change and did you get any pushback from early LPs as the fund got larger? How did the process play out… in what ways was it different than what you expected? How early do you go? How did you create urgency with prospective LPs to make a decision. From personal experience, I found a number of large LPs that preferred to wait until final close. You’ve gone on the record stating that you’ll avoid investing in arrogant founders, where many VCs specifically look for this character trait in entrepreneurs. Do you think it’s the best economic decision to avoid working with arrogant founders? Everyone says they’re a founder-focused VC… but when I speak with founders I find that there are very few that are actually qualify. What does this mean from your standpoint and how are you serving founders in ways that others aren’t? What are some of the key strengths of your pipeline and dealflow…. how are you seeing more deals and higher quality deals than others? The feedback cycle in venture is really long… you won’t truly know how your fund stacks up against others from you vintage for many years. How do you track progress and assess if you’re winning over the near term? After working at 5 startups, John joined a larger company launching the first mail-order prescriptions. After 4 years they had gone from zero to 1,500 employees and $2B in revenue. The Kansas City startup community began to take off in 2012. This lead to John’s position at Techstars in 2013 as Managing Director, where he ran 3 accelerator programs and built a strong network. 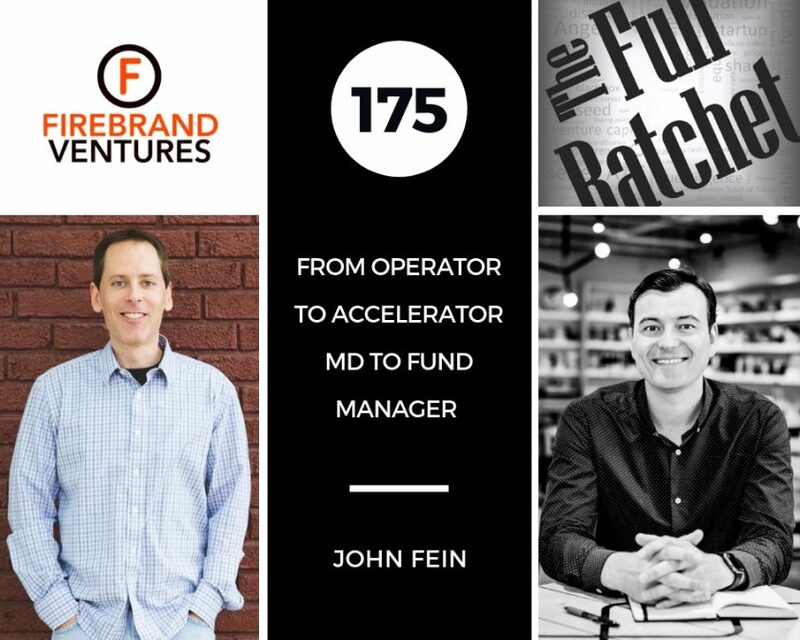 After recognizing the huge potential and shocking deficit of good sources for seed capital in the region, John launched Firebrand Ventures in the summer of 2016. Firebrand got to their first close in just eight weeks and hit their initial fundraising goal of $7,000,000 in six months, all from Kansas City LP’s. After two years, the fund is now at just under $18,000,000 and has invested in 18 companies. John stresses the importance of staying true to his cores ideals and never compromising on a team that he’s unsure about. A huge part of Firebrand’s evaluation process, when they go into diligence is focusing on really getting to know their founders on a personal level, in order to build a solid foundation of trust. John successfully built urgency by offering co-investment rights to any LP that invested in Firebrand’s first close, resulting in 14-15 relatively big names in Kansas City who invested. John closed 40% of the fund in the last 5 weeks. Arrogance is a trait John avoids in entrepreneurs because of his belief that it negatively trickles down into various facets of the business, making recruiting/retaining top team members difficult and driving away good investors. John’s definition of “Founder-Focus” setting expectations of a hard, non-linear progression. He doesn’t require perfection. He gets involved, without judgement or criticism. A specific way he gets involved is being very responsive as a “sounding board” when his founders need input. Guidance through asking the questions to allow founders to find the answers and relating to their struggles, is another approach John takes when building trust with his founders. Firebrand held their first CEO Summit for their founders, focused on peer interaction and discussion on what works, what doesn’t work and best practices. John recalls the experience being invaluable and they plan on holding the event annually. John shares his past experiences with VC’s that engaged in rude email behavior or went dark on founders after holding multiple encouraging meetings and how that behavior can prevent future collaboration with those investors. When tracking progress, the best metric to look at is revenue growth, because it sets the stage for what’s to come in the future.